There are so many ways to style chinos. This polka dot chinos is definitely unique and my absolutely favorite. To style chinos, keep it simple. For formal feel, dress it up with shirt and blazer. For me, styling this polka dot chino pants is all about simplicity with uniques accessories and details. This is the third time that I am wearing this pants. I previously wore it with a neutral ruffle off shoulder top for a event. It can also be styled casually with white tee and trench coat for spring transition. I can so imagine these chinos would look great with a trench coat! Stella these polka dot trousers are the bomb - I'd have never thought to style them with white heels but together they're perfect! I'm pinning this for spring inspiration, it's too cold to wear this at the moment in the UK... I long for warmer weather!! 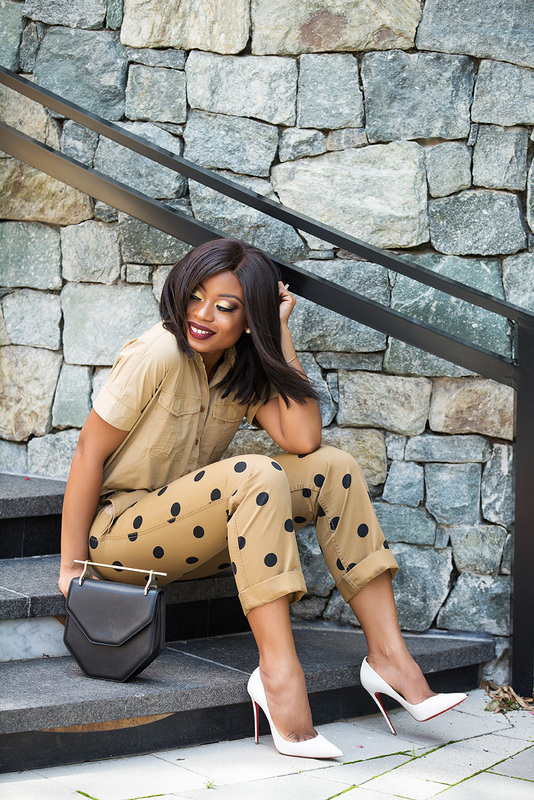 These polka dot chinos are everything and I love how you have styled them with the white pumps, so chic and classy as always.